Above: Jacqueline Wells in the serial Clancy of the Mounted (Universal, 1933). The slim, pretty, and spirited Jacqueline Wells, the heroine in a trio of 1930s serials, was both an attractive actress and a talented one, delivering chapterplay performances more subtle and multi-faceted than those of most of her contemporaries; not surprisingly, she enjoyed a much longer post-serial screen career than the average serial ingénue. However, despite her charm and her acting skill, she hasn’t received that much attention from cliffhanger buffs–an unfortunate but understandable result of the unhappily fragmented state of her serial vehicles; only one of them has survived intact into the home-video era. Jacqueline Wells was born in Denver, Colorado, but spent her early years in Texas, where her father held substantial oil interests. Her parents divorced during her childhood, and she moved with her mother to Los Angeles in the early 1920s. There, young Jacqueline began her film career; from 1923 through 1926, she worked periodically as a child actress in features for Paramount and various other outfits, and also appeared in the Pathe serial The Bar-C Mystery. She suspended her film career after 1926, in order to attend high school and study stage acting at the Pasadena Playhouse; this theatrical experience helped her to fit easily into sound films when she returned to the screen in 1931. She spent part of that year–and most of 1932–acting opposite Charley Chase, Mickey Daniels, and Laurel and Hardy in producer Hal Roach’s comedy shorts; one of her few non-Roach assignments during this period was the heroine’s role in the entertaining Universal serial Heroes of the West (1932). Universal gave Jacqueline the new screen name of “Diane Duval” for Heroes of the West, presumably in an attempt to erase audience memories of her child-acting days and establish her as a grown-up starlet. However, the sophisticated-sounding moniker didn’t stay with her beyond Heroes–and hardly fit her character in the serial; as Ann Blaine, the spunky daughter of a beleaguered frontier railroad contractor (William Desmond), she was more rambunctious than refined, regularly participating in horseback chases and battles with Indians–when she wasn’t animatedly bickering with her brother Noah (Noah Beery Jr.), or listening with feigned demureness to the admonishments of her fretful, serious-minded aunt (Martha Mattox). The teenaged Wells handled the tomboyish, juvenile aspects of her role very convincingly; her good-natured arguments with Beery and her subtly amused and annoyed reactions to her aunt’s lectures were particularly delightful. She was equally good in her character’s serious moments; her concerned and emotional outbursts when Beery was in danger, and her shy but eager demeanor during her romantic interactions with leading man Onslow Stevens, were just as convincing (and endearing) as her displays of youthful unruliness. Above: Jacqueline Wells impishly impugns the scouting prowess of Noah Beery Jr. (back to camera) in Heroes of the West (Universal, 1932). 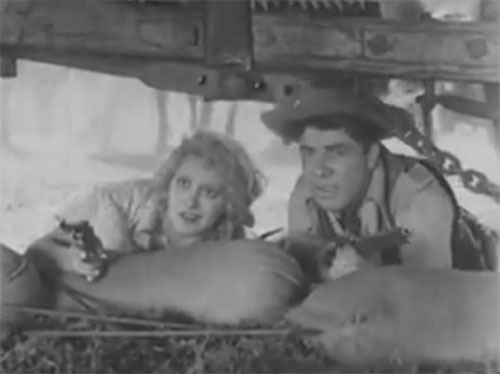 Above: Jacqueline Wells and Onslow Stevens hold off attacking Indians in Heroes of the West. 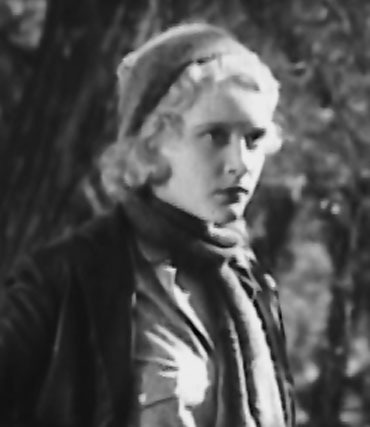 Early in 1933, Universal brought Jacqueline back for a second serial, the involving Clancy of the Mounted. Tom Tyler played the title character in this outing, a Mountie who was forced to arrest his brother Steve (Earl McCarthy) for the murder of a prospector, but then set out to find the real killer; Wells was cast as Ann Laurie, the daughter of the murdered man, who assisted Clancy in his search–when she wasn’t being attacked by the henchmen of conniving trader Black MacDougal (William Thorne), who was responsible for her father’s death and wanted to eliminate her too, in order to gain control of her late parent’s pitchblende-rich land. Clancy was a lost serial until 2012, when its first six episodes were found and released on DVD; these surviving chapters show Wells to very good advantage, in a more mature part than the one she’d played in Heroes of the West. She maintained a proper balance of fearfulness and courageousness when she was soaring off cliffs in runaway wagons, getting ambushed by renegade Indians, or plunging into rapids; she also did some strong acting in her quieter scenes–reacting with surprised grief and anger to the news of her father’s death, registering disbelieving shock when she learned that Clancy’s brother was charged with the crime, and kindly and warmly assuring both Clancys (and Clancy’s wife) of her belief in Steve’s innocence. 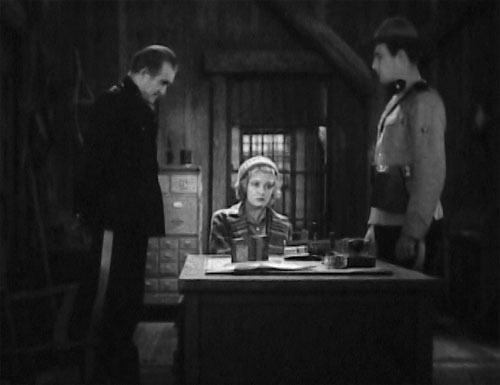 Above: Jacqueline Wells has just received sad news from Francis Ford (left) and Tom Tyler in Clancy of the Mounted (Universal, 1933). Above: Tom Tyler and Jacqueline Wells in a publicity still for Clancy of the Mounted. Later in 1933, Jacqueline made her third and final sound serial, independent producer Sol Lesser’s Tarzan the Fearless. All that remains of this effort is an eighty-minute British feature version and an incomplete single chapter (the ninth); judging from these fragments, it appears to have been a weakly-plotted and rather clumsy attempt to imitate MGM’s successful Tarzan features. The serial’s Tarzan was portrayed by Buster Crabbe, while Jacqueline played heroine Mary Brooks (not the expected Jane), who journeyed to Africa in search of her missing scientist father (E. Alyn Warren) and was threatened by hostile natives, slave traders, a thuggish and amorous guide (Philo McCullough), and the inhabitants of a lost city. Weak though Tarzan the Fearless appears to have been, Wells’ performance in it was just as good as her turns in her superior Universal serials; along with the standard serial-heroine emotions of pluckiness, alarm, and cheerfulness, she very effectively conveyed impatient determination (as she urged her safari on in the quest for her father), disgusted outrage (when McCullough’s character tried to force her to marry him), and romantic interest in Tarzan (her simultaneously wary and pleased expression, when she first realized that the jungle hero was in love with her, was a particularly fine piece of acting). Above: Jacqueline Wells and Buster Crabbe in Tarzan the Fearless (Principal, 1933). 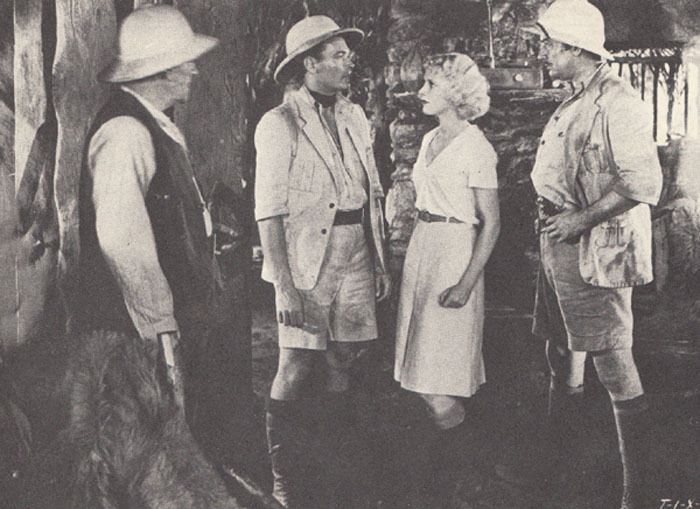 Above, left to right: E. Alyn Warren, Edward Woods, Jacqueline Wells, and Philo McCullough in Tarzan the Fearless. Wells left serials behind her for good after Tarzan the Fearless; her next two screen roles–major supporting parts in the W.C. Fields/Alison Skipworth comedy Tillie and Gus (Paramount, 1933) and the Bela Lugosi/Boris Karloff horror film The Black Cat (Universal, 1934)–launched her feature-film career in earnest. During the remaining years of the 1930s and the first few years of the 1940s, she took a few more A-film assignments from Paramount and MGM, and played leading-lady roles in innumerable B-pictures (chiefly for Columbia and then for Republic), while also doing stage work as far afield as Wisconsin. In 1941, she signed a contract with Warner Brothers, and changed her screen name to Julie Bishop; the newly-christened actress stayed at Warners over the next four years, playing leading parts in their B-films, and taking supporting (or, occasionally, co-starring) roles in their A-films, among them Humphrey Bogart’s Action in the North Atlantic and Errol Flynn’s Northern Pursuit. She married Air Force pilot (and future Hughes Aircraft executive) Clarence Shoop in 1944, and left Warners in 1945; she spent the rest of the 1940s and the early years of the 1950s doing sporadic freelancing for studios ranging from Sam Katzman’s Columbia unit (Last of the Redmen) to MGM (Westward the Women). From 1952 to 1953, she co-starred with Bob Cummings on the TV sitcom My Hero, but returned to a more irregular acting schedule after its cancellation; she retired in 1957, after making several television guest appearances and taking a few more prominent supporting parts in feature films (including the big-budget airline-disaster drama, The High and the Mighty). Her later years were devoted to family life, charitable work, and to her two hobbies–painting and flying. After a long life away from the cameras, she passed away in Mendocino, California, on her eighty-seventh birthday. The fates have made it impossible (at least for the time being) to see all of Jacqueline Wells’ serials in complete form; nevertheless, the high quality of her surviving chapterplay work still places her among the genre’s top heroines. Young though she was during her serial days, she showed herself already possessed of a large measure of the acting skill that would later bring her success in feature films. 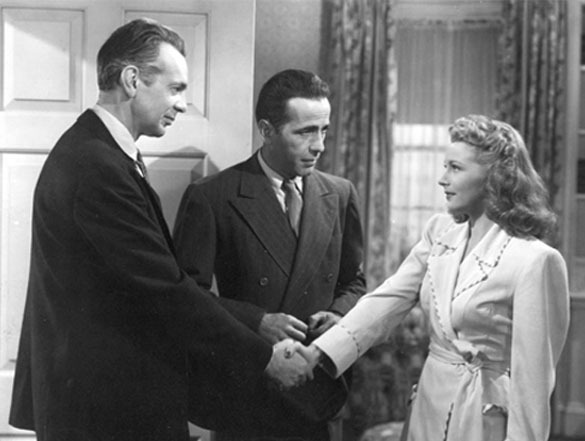 Above: Jacqueline Wells, in her “Julie Bishop” years, with Raymond Massey (left) and Humphrey Bogart in Action in the North Atlantic (Warner Brothers, 1943). Acknowledgements: My sources for this article were the Old Corral’s page on Jacqueline Wells/Julie Bishop, Mike Fitzgerald’s interview with Wells on the Western Clippings site, Wells’ Los Angeles Times obituary (by Myrna Oliver), a Milwaukee Sentinel piece (from 1939) about one of Wells’ stage appearances, and an informative e-mail from Ed Hulse.